I became the #1 tennis player in Canada in the under 14 division and continued through the years to train and compete with the best players in the world. Among them being Pete Sampras, Jim Courier, and Lindsay Davenport. After my junior tennis career I was given a scholarship to San Diego State University. I was then offered company funding and a sponsorship to play on the pro circuit. After all my years of hard work I was off to play on the professional tennis tour. I traveled all over the world from England, Paris, and Amsterdam, to Monaco, Germany, Canada, Hawaii, Australia, and all over the United States playing on the pro tour for four years where I earned a world tennis ranking. In a blinding moment that changed my life forever, I was a passenger in a horrible car accident. I’ll never forget the sound of the metal crushing and the onset of intense pain in my neck and back. When the smoke cleared I had been badly injured. I put in two years of physical therapy, but as hard as I tried I could not regain the form of the world class level athlete I once was. So, with the abrupt end of giving 19 years of my life: from my childhood, teens and early twenties to tennis, my professional career was over. The thousands of hours on the court, the countless miles of running in the snow of Canada and heat of Florida. All of the strength training and all of personal sacrifices endured. GONE. At first I figured “they” must be right. But then I thought, “How do they know? This is my life and no one can tell me what I am able to accomplish until I am done trying.” When I told people that I had decided to become a professional musician at age 24 they would laugh at me. That just made me want it more. 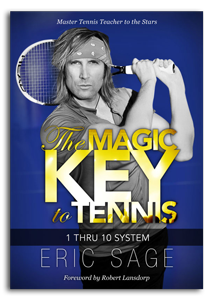 Eric now tours the world as a master tennis teacher, singer and motivational speaker. Who says dreams can’t come true!